This was the e-mail I received over three weeks ago. This note coincided with repairs at my apartment complex in Chicago. For a few hours during the day, management switched off the water to do some repairs. All residents received an e-mail; there were posted messages throughout the building; we were warned that after a certain hour, until a certain hour there would be no water. When I returned from work on the day of the scheduled outage and turned on my faucet there was not a trickle. I was annoyed. It was another hour before running water returned to my comfortable Chicago apartment. The next morning when I got up to shower, all memory of the scheduled water outage was forgotten. I turned on the shower and without a thought took a long shower, using buckets and buckets of water. Can you imagine going 15 days without water? Wouldn’t it be a news worthy ordeal if 50% of Chicago were out of water? Yet, did you hear a peep about the shortage in Dakar on any popular news source in the USA? It is as if what happens in the rest of the world is trivial and has nothing to do with us. This makes me so angry. Of course, the troubles in all parts of the world affect us– if not directly, then indirectly. I knew about this water shortage in Dakar because of this message from Chad Rimmer who serves as global personnel in the region. During this shortage I was not only concerned about all the people I know— him and his family, the leaders and members of the Lutheran Church in Senegal, those who work for the Senegal Lutheran Development Service— but all the people in Dakar. Chad wrote to inform us of the situation and ask for our prayers. 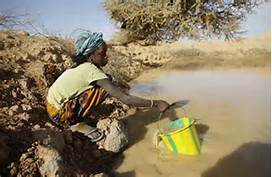 I have no answer or pronouncement for the realities of life in places like Senegal where water outages and shortages are normal. All I know is that we continue to pray for clean water, for food, for health care; we continue to pray for the entire world to have the necessities they lack and that we so easily take for granted.